← Whew, the month from hell! Yes, I know… I’ve been a very bad blogger! Just so much stuff to stay on top of, something had to give. LOL! Work has been hell, pure hell. I am so looking forward to vacation in December, I am definitely going to NEED the time to recuperate from this project! So… I’ve at least gotten quite a bit of knitting done. Scarves for holiday gifts, more dishclothes for the kitchen, several Calorimetries for others. I’m working on a gift for my Dad now, he asked for saddlebags for his Dane, Rocky. He wants them for when they go to the open markets. I’ve got everything all knit up, I just have to rethink the fasteners. I originally used those buckles you have on overalls? Yeah, they aren’t working out too well, at least not when I try putting it on Leonardo, anyway. I’m thinking heavy duty velcro is going to be the solution. On the design front… I really haven’t had much time recently with all the gift making. *sigh* I hope to get some sock OTN soon, I want to get something going for my guys for gifts too. I’m heading out the door for a very slow run… trying to build back up from the ground floor is SO frustrating!! But at least the weather is simply perfect for running, it’s finally cooled down. YAY! :D I had wanted to do the Gulf Beaches Half Marathon in December, but I won’t be ready in time for it. *sigh* I fully intend to do that race at one point, it is fantastic! For fun today, I give you this 5 minutes quiz: How many colors can you name? 5 Responses to Bad blogger, BAD! 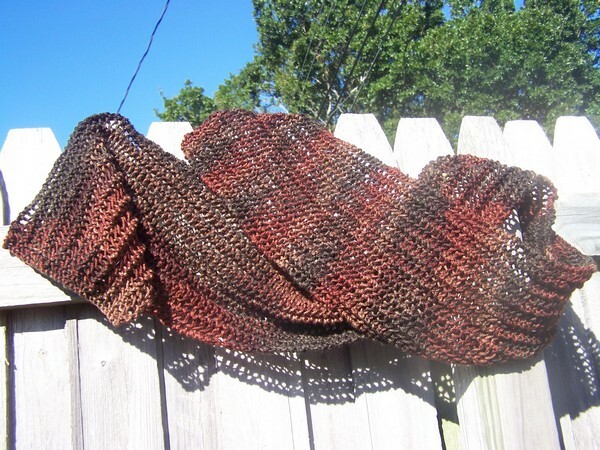 Lovely scarf… isn’t it great that in all that chaos we can always turn back to knitting? can’t wait to see the saddlebags!! The Gasparilla half is on March 1st. Personally, that’s a tad too late to run a half in Florida as I prefer freezing over sweating my tail off. I’m not sure what they were thinkin’ when they set the date for that one. Of course, there’s always next year. kv – *grin* I’ve got to pick up some velcro to finish them off… but suspect getting pictures is going to be a challenge! Louise – thank you!! :) So happy to see ya!